Do you ever wish your neighborhood was cleaner and safer, and that you knew more of your neighbors? These are a few of the wishes San Francisco teens expressed to university student “hackers” from across the country at citizenAR, a State Department-funded hackathon — a tech design challenge — and tech carnival. UC Davis Hacker’s Club team receives award from Laureen Heinz from Deloitte Digital. On Sept 30, 2017, 12 interdisciplinary teams from universities around the nation imagined new ways of engaging city-dwellers in making their environment more sustainable, just, and livable using augmented reality in fun, social, and gaming ways. The event was held in partnership with The Salvation Army Kroc Center in the Tenderloin district of San Francisco — one of the most challenging neighborhoods in the city and nation. The event was initiated by a team including a Fulbright Scholar, Fulbright English Teaching Assistant, and two Critical Language Scholars. They came up with the idea at an Alumni Thematic International Exchange Seminar (Alumni TIES) in September 2016, which brought together U.S. alumni from a wide variety of State Department exchange programs around the themes of global affairs, climate change, and the digital age. Alumni TIES is funded by the U.S. Department of State’s Bureau of Educational and Cultural Affairs and implemented by World Learning through a cooperative agreement. The program brings alumni of U.S. government-sponsored exchanges together to participate in seminars focused on key regional issues. Participants then have the opportunity to apply for small grants to implement projects that make a positive impact in their community. Through networking with professionals from a diversity of fields, the team realized that little had been done to apply emerging, immersive technologies to solve problems of climate change — urban sustainability in particular. During the hackathon, teams met with tech, business, and urban sustainability leaders from across the Bay Area through a variety of panel discussions and one-on-one meetings. “There was a lot of mutual learning, from mentor to participant and vice versa,” says Nels Nelson, a senior planner at Stantec and founding member of the event organizing team. The collegiate hackers also spent time with teens and other residents from the Tenderloin neighborhood to gain first-hand insights into the livability and environmental challenges they face on a daily basis. Their top complaint was they were tired of walking past trash and navigating around drug deals. “Our teens benefited the most as they felt valued to be part of the event that focused on the Tenderloin,” says Major Raymond Erickson-King, Administrator of the Salvation Army Kroc Center. Community members try out new virtual reality experiences at the tech carnival. 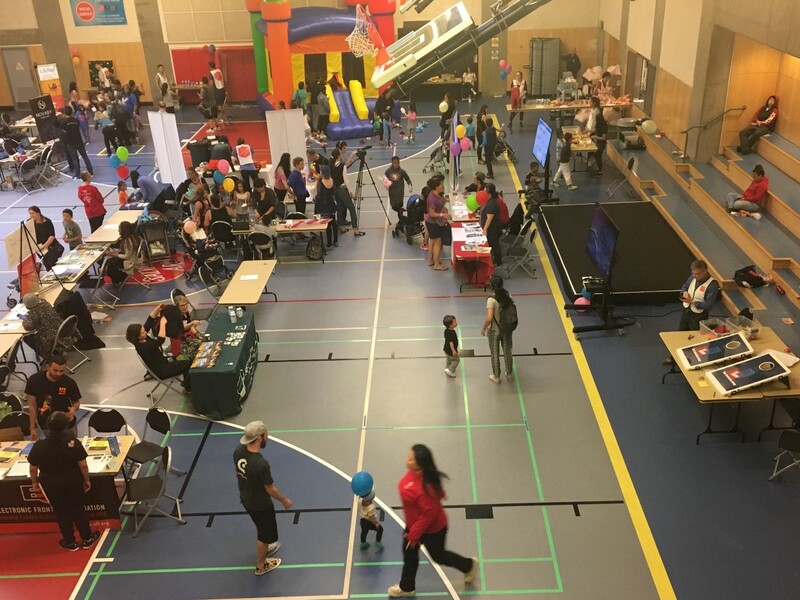 In order to extend the benefits of the hackathon to the community, a simultaneous tech carnival was held in the Kroc Center gymnasium. The carnival provided the local youth and families access to the fun, cutting-edge immersive technologies that the hackers were using to design solutions. At the fair, kids of all ages donned virtual reality headsets and explored new worlds as their friends eagerly awaited their turns to test out the next experience. “It was fun and rewarding to watch the kids experiencing these emerging technologies at the carnival,” says Julia Beabout, president of Qiao LLC, and founding member of the event organizing team. A number of tech and sustainability nonprofit organizations also participated in the tech carnival. Through these, Tenderloin residents were able to connect with tech education and sustainability initiatives in their neighborhood and beyond. More than 20 generous organizations donated their time and resources to make the tech carnival a success. 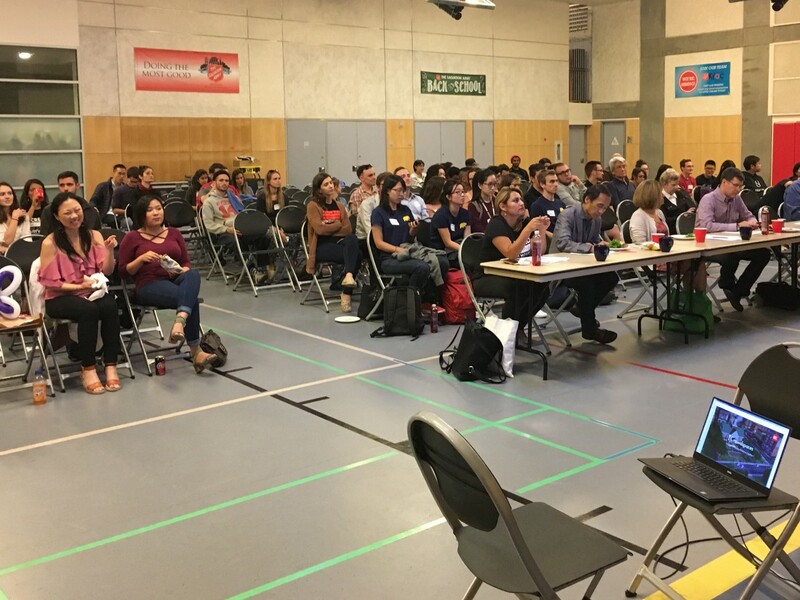 Audience members watch the hackathon pitch sessions at the The Salvation Army Kroc Center in San Francisco. At the end of the carnival, the university teams pitched their best ideas from the hackathon to a panel of judges in a heated competition. Of the dozen teams participating, there were four winners: UC Berkeley’s Haas School of Business, UC Berkeley’s School of Information Systems, UC Davis’ Hackers Club, and the Academy of Art University (AAU). The ideas resulting from the daylong event were creative and highly relevant to addressing the need for cleaner, safer public spaces. Winning solutions include apps that allow teens to report incidents of urban blight to local authorities and navigate their neighborhood safely. Others created a series of virtual commons in safe locations throughout the neighborhood and allowed residents to express how they felt about different places at different times with emoji-like icons. The prizes for the winning teams include augmented reality trophies by Novaby.com and a variety of mentoring and pitch sessions from Deloitte Digital, The Miller Center, and the SF Mayor’s Office of Civic Innovation (MOCI). Kroc Center youth will be invited to observe and participate in the follow-on mentoring sessions. All hackathon participants are also eligible to apply for a $10,000 grant to move their social good, community-oriented augmented reality app ideas forward. The grant will prioritize projects that involve the Kroc youth from the Tenderloin. Additionally, the Make School has offered five scholarships to their summer boot camp: two for the university students and three for Kroc youth. “The hackathon showed how technology can be applied to raise the quality of life for the residents of the Tenderloin and address the most pressing social issues,” says Laureen Heinz, senior manager at Deloitte Digital. 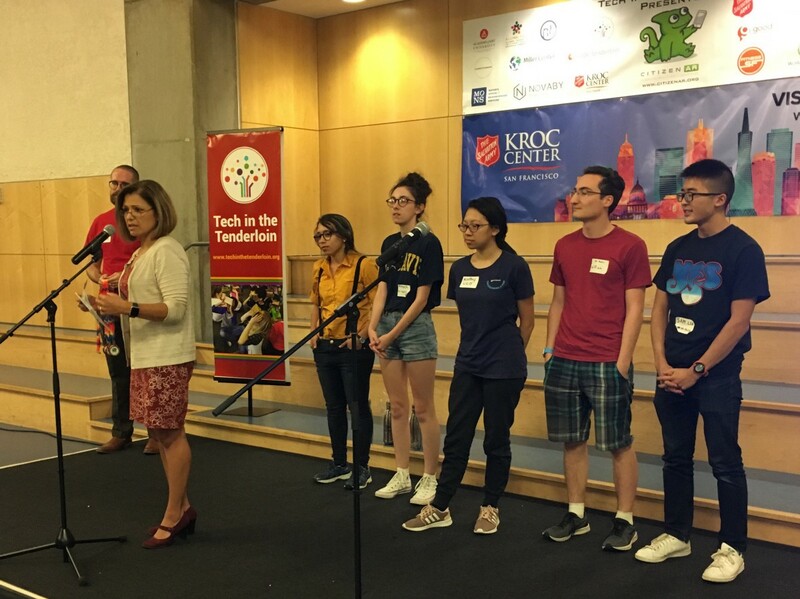 In order to sustain that impact and the impact of the event, a nonprofit initiative called Tech in the Tenderloin (TNT) has been established in partnership with the Salvation Army’s Kroc Center. TNT will expand career imaginations and opportunities for youth and families in our nation’s most challenging neighborhoods by connecting them with emerging tech through fun, innovative activities and educational programming. The team is already working on planning their first season of tech programming at the Kroc Center.